Holidays, birthdays, Mother’s day, bridal showers, and any other gift giving occasion can add to curbside trash, sometimes as much as 25% more. Instead of throwing out your used gift wrap, what if you could plant it and grow real flowers. Well, Little Kay Gardens has done just that. 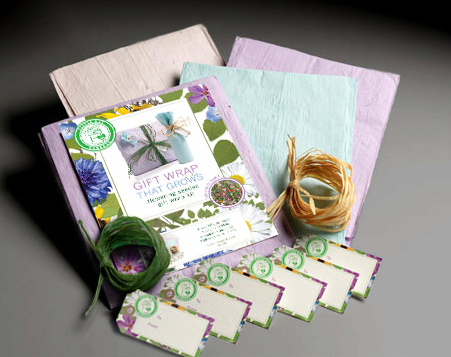 They have created pretty gift wrap paper that is made from 100% recycled newspapers and is embedded with wildflower seeds. So, after the recipient opens their gift, they can plant the paper and grow flowers! In each pack you get 4 large 24″ x 36″ sheets of paper, 2 colors of raffia ribbon, plus 6 gift cards with instructions. You can use the paper as wrap for up to 8 shirt boxes or as tissue paper in a gift bag. The paper includes wildflower seeds for Corn Poppy, Red Coreopsis, Plain Coreopsis, Black-eyed Susan, Baby Snapdragon and more. Make the world greener – one gift at a time with Little Kay Gardens! How sweet! This is definitely a great gift idea. This also reminds me of our hangtags — our organic shirts for women come with plantable hangtags! 🙂 I think it’s great that many companies are making sustainable choices. It doesn’t matter how big or small they are – they all make a difference! i received some over the holidays and my flowers are starting to bloom!